fatBuzz: Social Media Podcast 47 - Google+ has 250 million active users and Elvis IS alive and Tweeting! Social Media Podcast 47 - Google+ has 250 million active users and Elvis IS alive and Tweeting! Taking part in Social Media Podcast Episode 47 we have Gordon White, Kyle Murdoch, Kirsty Hunter, Iain Murray however, this episode could well be renamed the Google Podcast because Iain was the only one who had done his homework. Nevertheless, we do manage to get the odd non Google topic squeezed in! As usual, the banter is good and the conversation moves along with good humour and, we hope, some interesting information from the world of social media and emerging technology. We're fast approaching Episode 50; have you any ideas what we should do or, do you want to take part? Let us know - email gordon@fatBuzz.com or kyle@fatbuzz.com. Elvis gets a mention and, we chat briefly about Morton Fraser's fascinating podcast about what happens to your online stuff when you die. We also pose some new questions for our friendly legal experts about using edited Tweets as testimonials in your marketing material - we will be interested to hear their opinion this! Google+ - Reposturing has begun and, 250 million active users? Introducing Nexus7 - Great if you like your tablet half baked! Google Play - Playing at being iTunes? Google Now - Big Brother's not watch you, he's directing you! Microsoft Surface - Has it surfaced to soon? Waze - A great way to get people to your chip shop? Twitter - No longer feeding to Linked-In - great news! 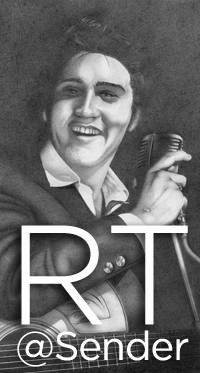 Elvis is alive and Tweeting! New Media Breakfast - Who won the big Social Media v SEO The Face Off? What length are your Tweets? We hope you enjoy the podcast, if you have any comments to make or topics you would like us to discuss please leave them here on the blog or on our Facebook Page.